The Celtic goalkeeper will be hoping he can make his first appearance for his country. Celtic goalkeeper Fraser Forster has been recalled to Roy Hodgson's England squad, ahead of the World Cup qualifiers with Moldova and Ukraine. The 25-year-old goalkeeper has earned his fourth inclusion to the England squad, and joins Joe Hart and John Ruddy in competition for the goalkeeper's position. 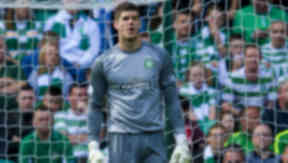 Forster has been an imposing figure in the Celtic goal over the last three years, keeping 60 league clean sheets since joining the club in 2010. He has gone on to make 150 appearances for Celtic, and played a pivotal role in his side getting through the Champions League group stages last season. Forster was first called into the England squad in October 2012, and retained his position for the friendly with Sweden in November of the same year. While he was named amongst the squad for a third time in March 2013, he was not included in the squad that faced Scotland in August. The Celtic goalkeeper will be hoping that he can make his first appearance for England in the upcoming fixtures, with England looking to secure their place in the 2014 World Cup in Brazil, especially as there have been question marks over the form of English number one, Joe Hart.